Review of "Islamic Banking and Finance: What It Is and What It Could Be"
This book is aimed at professionals new to Islamic banking and at students. A significant amount of effort has gone into its production. It has ambitious objectives, to outline current Islamic banking practice and how it should be improved. Overall, the book fails to achieve those objectives due to insufficient focus on the needs of its readers and insufficient balance in its coverage. I enjoyed reading it and commend 1st Ethical for enabling the book to be created. This is an impressively well presented book, hardbound, printed on high quality paper and 500 pages long including the appendices and index. Including the editor, there are 12 contributors including experts in Shariah, lawyers and academics. However, only one of the authors, Shaharuddin Zainuddin is a practicing banker. Unlike many multi-author publications, with two exceptions (pieces expressly appearing over the names of the editor and of Nejatullah Siddiqui), specific parts of the text are not attributed to named authors, a process that clearly attaches the author’s reputation to the text that he writes. However, page xxiv sets out in broad terms who was the main contributor of each section. "This text has been designed for use by professionals new to the field of Islamic banking and finance and by students at undergraduate level or above. While many reference works focus on a narrow set of content, "Islamic Banking and Finance; What It Is and What It Could Be" expands its coverage to include the historical, theological, commercial, legal, institutional and macro-economic factors affecting the modern world of Islamic banking and finance. It is organised into four main sections: Islam and the Shariah, Traditional Contract Forms, Contemporary Practices, and A Response to Capitalism. In a rare approach to the topic, the content encompasses views both for and against the current direction of the Islamic banking and finance industry and suggests a number of basic reforms at the institutional and contractual levels. Traditional and contemporary interpretations of Islam are contrasted, along with differences of opinion among the various schools of thought, so that the reader can better understand current discourse among scholars of Shariah. And in a section devoted entirely to the modern application of Islamic contract law, fourteen case studies provide a detailed analysis of the extent to which modern Islamic financial products adhere to the legal principles outlined elsewhere in the book." This is a very ambitious set of objectives. Despite the length, and the apparent dryness of the subject, I found the book very easy to read and enjoyed reading it. It is well laid out, with excellent typography and a high quality of proofreading. It is also very well referenced with an extensive bibliography and many footnotes. The book is highly structured, with an outline that goes five levels deep. Unfortunately the use of multiple writers has resulted in some of the treatment becoming very “bitty.” For example the use of secular or Shariah law is covered in several different places, instead of being brought together in one. This significantly detracts from the quality of the book. The objectives were too ambitious for a book that is only 500 pages long. The writers have not remained focused on the needs of the target readers. The fragmented coverage of key issues indicates that the editor has not maintained sufficient editorial control over his 11 co-authors. The book, despite its claim in the above quote, is not properly balanced. There are many arguments against current Islamic banking practices, but few in favour of them. The editor is well known for his criticisms of current Islamic banking and I believe this is the reason for the absence of balance. "However, in the backdrop to all of this, there lurks an intractable political problem. The Islamic banking and finance industry has so far embraced age-old Islamic contract types as the basis of its client relationships. While it is increasingly clear that such a strategy cannot succeed within an institutional framework that contradicts Shariah, the replacement of that framework necessitates a challenge to an interest-based industry whose annual revenues extend into trillions of dollars. Is the Islamic banking and finance industry facing this challenge? Does it even seek to? The fact that interest-based banks are so heavily involved in promoting the Islamic financial system should give us pause for thought in this regard. It is an alliance whose consequences are particularly evident in the intellectual domain. Those who disapprove of the Islamic methodologies being employed by large financial organisations are unlikely to be appointed as Shariah advisers by those same organisations. Students who come to the subject afresh are presented with case studies that discussed the ‘what is’ of Islamic banking and finance rather than the ‘what should be’. By such means, narrow contemporary understandings of Islamic banking and finance are reinforcing themselves. There is of course nothing new in this. When the main commercial banks of the United Kingdom sponsored the establishment of the LondonBusinessSchool, they did so in order to develop the executive mindset that is required of bankers, not revolutionaries." The editor is of course entitled to hold views as revolutionary as he wishes. Unfortunately, these have gotten in the way of providing students with an objective textbook on what Islamic finance is and how it operates, which I regard as a necessary precondition before going on to promote the manner in which the editor would like it to change. In the short review, I have attempted to give a balanced view of the book as a whole. As I have said, although I enjoyed reading it, in my view the book fails to achieve the objectives it set itself. The long review below is almost entirely critical, and I want to explain the reasons for this. I initially read the book from cover to cover, as I would with any other book. A while later, I went through it all again, pencil in hand, and annotated pages that I found particularly interesting. Inevitably, these are pages where I either disagree with the text or pages where the authors have simply left issues "hanging in the air" rather than seeking to resolve them. There is nothing interesting or worthwhile to be achieved by my writing lots of words saying "the authors have covered X well" followed by "the book covers Y clearly." Readers of this long review should assume that where I have said nothing, I am broadly happy with the book’s coverage and consider that appropriate for its target audience. As explained in more detail below, I consider that almost all of part 1 and all of part 4 could have been deleted without reducing the value of the book to its target audience. Together they comprise 169 pages out of its core text of 450 pages. Deleting this 1/3 of the book could have made it shorter, or better still have allowed the coverage in parts 2 and 3 to expand, since that is what the target audience needs. As explained in the short review, the coverage of some important subjects has been fragmented. Accordingly, in this review I have brought together my comments on those subjects where appropriate. Chapter 1 "Islam and the Shariah"
Section 1.1 concentrates on history. While I enjoyed reading this, its inclusion in the book demonstrates the inadequate focus upon the needs of readers. The historical coverage is unnecessary for those who are familiar with the early days of Islam. Conversely, for those who are not familiar, it is too short and contributes next to nothing to their ability to understand Islamic finance. The weakest part of this section 1.1 is 1.1.2.1 "Sunni and Shia." In less than a page, the book tries, but of course fails, to do justice to this fundamental division within the Muslim community; it is just not possible to do the matter justice in the space available. In any event it is irrelevant to the subsequent coverage of Islamic banking and finance since as far as I am aware the Shariah analysis in the rest of the book does not cite any Shia sources. Similarly section 1.2 "Religious Codes" covers the theology of Islam. Again, most Muslims will be familiar with the content and for those new to Islam the content is not relevant. For example 1.2.3.3 is devoted to "Fasting" without any thought being given as to whether a student of Islamic banking needs to know anything about this Muslim practice. Overall, there is some interesting material in chapter 1. However the text displays insufficient editorial discipline regarding focusing on the needs of the reader. 88 pages, nearly one quarter of the book, are devoted to material that is of little help to students or practitioners of Islamic banking and finance while material that is genuinely relevant to Islamic banking finds itself squeezed for space. The coverage is also too sketchy to be of any real value to trainee Shariah scholars. In any future edition of the book, this material should be deleted apart from those parts (some mentioned below) which are directly relevant and the coverage of those relevant parts should be expanded using the space made available by the deletion. While reading the discussion below, please note the section numbers. They show how this subject has been broken up and scattered around the book. 1.4.10.3 "Bifurcated Court Structures" provides interesting coverage of how Muslim countries have historically dealt with secular and Shariah legal issues. It needed to be longer. I was disappointed that Malaysia is not mentioned here as it has clear rules to demarcate those parts of the legal system where Shariah is applied from those parts which are secular. 1.4.12 "Jurisdiction" addresses the very important subject of what laws and courts are used for Islamic finance. Despite the writers’ dislike of the use of English law, they do manage to explain why English law is used for so much of Islamic finance. "With the growth of the Islamic finance industry in recent years, it has become common practice in contracts that seek to be Shariah compliant, to include clauses that appoint English law as the governing law and give the courts of England jurisdiction to adjudicate any disputes. There is no doubt that such a practice would be considered anathema by most Muslim scholars, but it is useful to investigate why such a practice has arisen. To this end we might think of a market of laws, in which various jurisdictions compete with each other in order to attract "business". Here, jurisdictions that are perceived to provide fair and quick arbitration are more likely to be chosen. However, there is a perception, which holds some truth, that none of the judiciaries in Muslim countries are able to provide a fair and efficient service. When it comes to adjudication, parties therefore often opt for the English courts." The above paragraph is accurate, although the style is rather “mealy mouthed.” The writers could have said that contracting parties want a legal system where the law is clear, contracts can be drafted to minimise disputes, and where the court system operates reliably and speedily, and that is why they choose English law. "We should note that although the raison d'être of Islamic banking is to follow the Shariah, in most cases legal disputes on matters of Islamic banking do not fall under the jurisdiction of a Shariah court even when there is one. In Malaysia, Islamic banking cases are treated in the same manner as any other commercial dispute. Hence, they are adjudicated under the principles of common law, considered as a civil law contract, and enforced in civil courts according to the contractual terms stipulated. In many other countries, including in those of the Arabian Gulf, Islamic banking contracts are written under English law." The authors note the above, but for the benefit of students should have gone on to explain why the above is the case. The reason is simply that the Shariah courts are insufficiently well developed, and provide insufficient certainty regarding their judgements, for them to be used in commercial matters. Chapter 2 "Traditional Contract Forms"
This is the part of the book that will be most valuable to students new to Islamic finance. Islamic finance is often described as "Shariah compliant finance" and a key part of that is the requirement for the contracts used to comply with Shariah. The chapter starts with 2.1 "Introduction to Muamalat" and explains that muamalat consists of the laws that apply to the relationships between man and man. 2.1.1 reminds us that "According to Ibn Taymiyyah, in matters of ibadat [the relationship between man and God] everything is prohibited unless specifically allowed, while in muamalat everything is allowed unless specifically prohibited." Unfortunately, for example in the later discussion of limited liability, the authors fail to keep this saying firmly in mind throughout the rest of the book. 2.1.3.1 "Types of Contract" illustrates how easily misunderstandings can arise when translating from one language into another. The section mentions a large number of types of “contract”, including “contracts” of charity such as a gift or a loan. In English law the making of a gift is a unilateral act and most English lawyers would not call it a contract. Accordingly, when translating the Arabic word "Aqd” into English, instead of always using the word “contract” it would be better to choose different English language words, depending on the context, to avoid the risk of English-speaking readers being misled. 2.1.3.2 "Cornerstones and Conditions" contains a clear explanation of “cornerstones” (without which a contract cannot exist) and “conditions” where the presence of a prohibited condition may cause the contract to be defective (in the view of Hanafis) or void in the view of all the other schools of law. The book would potentially have been more educational still if it had covered side-by-side the Shariah and English law requirements for a valid contract, the English law grounds under which a contract may be void due to breaching public policy, and the circumstances in which contracts are void under Shariah. 2.1.3.7 "Distinguishing Between Promises and Contracts" needed to be much longer given the importance of wad (promise) in modern Islamic finance. The section discusses whether promises are legally binding under Shariah and summarises the ruling of the Islamic Fiqh Academy setting out when promises are enforceable. The section goes on to discuss how commonplace mutual promises are in modern Islamic banking and the way that they are used to sidestep the prohibition against contracts in which both counter values are deferred to a future date. 2.1.3.8 "Bankruptcy" demonstrates how underdeveloped is the Shariah law of bankruptcy. This is an area where Shariah scholars need to do much more to develop Shariah law if they want it to be used instead of secular law. While coercion is unlikely to be an issue in Islamic banking, the coverage in 2.1.4.2 "Coercion" is unsatisfactory as it is so inconclusive. While in part this is due to the differing views of the schools of thought, the authors should have expanded the coverage to reach some conclusions. It would also help to give illustrations of how the issue can be relevant (as I believe it can) in Islamic banking and finance. As elsewhere, the treatment here demonstrates the recurring failure to remain focused on the needs of the target readers. "On this basis, Kamali argues that the seller of a modern commodity futures contract may not be practising gharar even though he does not possess the underlying commodity at the time of contracting. This is because the futures clearing house guarantees all sales between buyers and sellers of futures contracts and keeps a stock of the underlying commodity so as to be capable of fulfilling this guarantee in those cases where a short seller fails to deliver on the agreed date." Having explained what Kamali says, the authors then proceed to ignore it instead of stating whether they agree or disagree with it and giving reasons why. This lack of intellectual rigour significantly detracts from the book, and is found repeatedly. 2.1.4.6 deals with "Legal Tricks", namely the use of permitted contracts to achieve a result not allowed by Shariah. The authors point out that organised tawarruq [commodity murabaha] can achieve the same economic effects as a fixed term fixed interest rate loan and state that it is prohibited by most Muslim jurists. However they fail to mention that organised tawarruq is fundamental to modern Islamic banking practice. That is something the target readers need to know. 2.2.5 discusses “Murabaha” whose "Purpose and Definition" is covered in 2.2.5.1. The authors state that "Murabaha has traditionally been used as a type of sale contract, not as a financing contract in its own right. However, many modern scholars have accepted the use of Murabaha as part of a financing package through the technique known as ‘Murabaha-to-the-purchase-orderer’." This understates the extent to which Murabaha is essential to modern Islamic banking where it is used to provide credit for a fixed period for a fixed price. The sole purpose of an Islamic bank in engaging in a murabaha transaction is to provide finance (in the form of the deferral of the sale price) to a customer by charging that customer a higher selling price than the price paid by the bank. "In the most widely accepted form of murabaha, there is no purchase orderer, and the bank instead holds the object of sale in its ownership (for example, cars in a car showroom). Only then does the bank commence negotiations on the sale of those objects under murabaha contracts. This requires the bank to take capital risk on the object of sale (for example car prices may decline while the bank is holding them in stock). Since banks typically do not wish to take such a risk, they usually prefer the murabaha-to-the-purchase-orderer model. Here the bank’s customer is required to sign a promise to buy the object of sale from the bank before the bank expends its capital in acquiring the object sale from the marketplace." The above quote goes to the heart of the authors’ objections to modern Islamic banking practice. When they say "most widely accepted form" they mean most widely accepted by those who believe that banks should be entrepreneurial traders in goods. However Islamic banks are no more entrepreneurial traders in goods than are conventional banks. The purpose of all banks is to provide finance to customers and to charge them for the finance provided, not to take a risk on the market price of goods. "Receivables due under a murabaha contract cannot be securitised and sold to investors since this would be a sale of a debt which is generally prohibited under Shariah (except where it takes place at face value). However, the practice is widely adopted in Malaysia, where debt sale is approved by the national Shariah board." The authors fail to discuss why the Malaysian national Shariah board takes a different view of the issue than do the authors. As a more general point, the book tends to ignore or downplay Malaysia despite the fact that the Malaysian Islamic finance industry has been particularly innovative (for example inventing sukuk) and invests heavily in Shariah research. 2.6.1 discusses “Wakalah.” The remoteness of the authors from current Islamic banking practice is illustrated by the fact that the discussion of wakalah fails to mention the extent to which it is used in the Islamic inter-bank market for making placements of money as an alternative to organised tawarruq. 2.7 covers "Islamic Inheritance Law and Wills." Its inclusion is understandable given that two of the authors are from 1st Ethical and specialists in the subject. I found it very interesting to read, but question its relevance in a book on Islamic banking and finance. The issue is to focus on who will be reading this book and what they hope to get out of it. The same applies to the extended discussion of zakah. For example 2.8.11 deals with "Entitlement to Receive Zakah Distributions." I do not see how the coverage is relevant to Islamic bankers who, if they need to distribute zakah money from their organisations, normally transfer the money to an appropriate Islamic charity. I was mystified by inclusion of paragraphs 2.8.11.5.3 & 4 which suggest that "Committed Muslim Leaders" and "Muslim Leaders Whose Faith is Weak" might be appropriate recipients of zakah. Similarly 2.8.11.6 “In Freeing Slaves Owned by Others” ignores the fact that legal slavery has been abolished in every country that I am aware of. For simplicity, the stock lending fee is paid on Day 1. The cash deposit is needed as collateral to protect the Stock Provider against the risk of the Speculator who has borrowed the stock from becoming bankrupt. Speculator will make a profit if the stock price falls and he can buy it back more cheaply; he loses if the stock price rises. £x is the current market value of the shares. £c is an appropriate credit charge for owing £x for 30 days. £f is the economic fee payable to the stock provider for the supply of the stock for the 30 days. Here for convenience it is effectively suffered by the Trader on day 30, when the two murabaha transaction sale prices are paid. 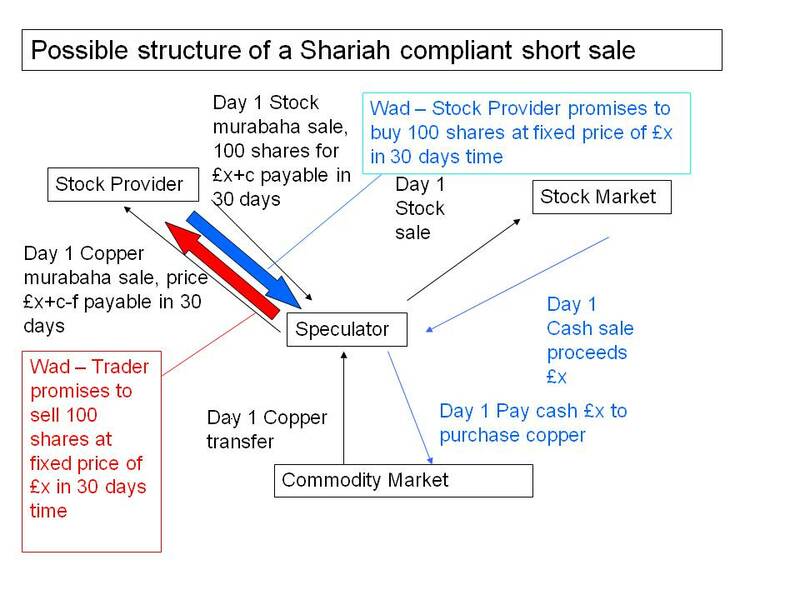 The copper murabaha transaction is needed to reduce Stock Provider’s credit risk, as with the cash collateral in the conventional stock loan. The Stock Provider immediately sells the copper in the marketplace for £x; transaction not shown on diagram for space reasons. •There is no payment for either wad, but they are essential to the transaction. 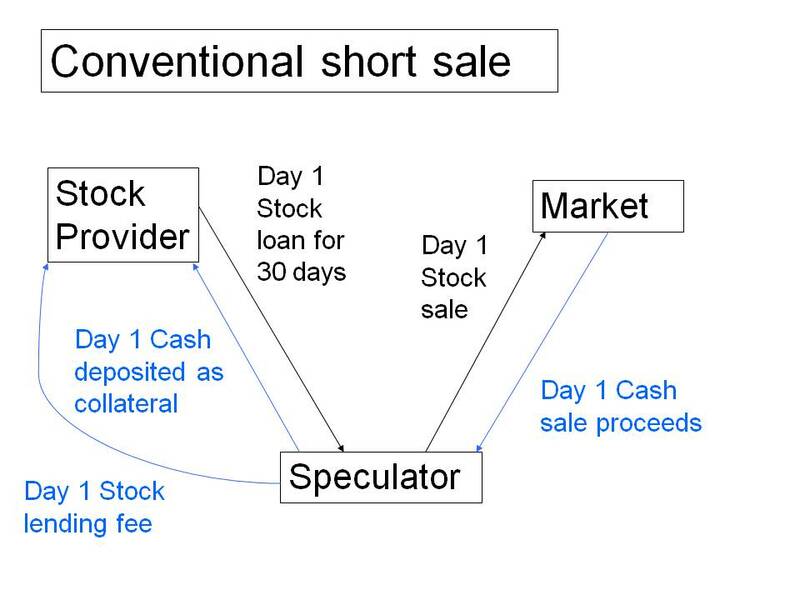 It is the wads that provide Trader with the “short” position, but the earlier transactions are needed to provide him with the shares to sell in the market. 2.9.7 "Credit Enhancement and Guarantees" explains how guarantees of securities which repackaged sub-prime mortgages led to the global financial crisis. There is a small mistake since it states that as well as AMBAC the other guarantor active in the market was AIG. This is inaccurate. Apart from AMBAC the other big guarantee insurer was MBIA. AIG's problems arose from a different activity, namely writing large amounts of credit default swaps. While a credit default swap has similar economic characteristics to a guarantee, it is not actually a guarantee. 2.3.1.4 "General Conditions in Partnership Contracts" caught my eye as a former member in a professional services partnership, namely PricewaterhouseCoopers LLP. "Profit-sharing ratios are to be defined precisely as a proportion of profit, but specification of a fixed or minimum amount of profit for one or more partners is prohibited since this would contravene the riba prohibition." If the statement is accurate, it illustrates how Shariah needs to develop to take account of the fact that a partnership of active partners involves them both contributing capital to the partnership and working in the partnership business. With a partnership such as a professional services firm, almost all of the economic profit derives from the personal activity of the partners in either giving advice to clients directly or in supervising the work of employees of the partnership. Very little of the profit arises from the use of the partners’ capital, although no professional services firm can run without some capital. From an operational perspective, partners often need to be able to guarantee a minimum profit share to incoming partners, and also many major professional partnerships finalise their profit allocation ratios after the year is over, rather than before it starts, to take account of the individual work effort and success of the partners in the firm during the year in question. On the basis that in muamalat everything is permissible unless expressly prohibited, I would want more than the above statement of the authors before concluding that such professional partnerships were conducting their affairs in a manner that is not compliant with Shariah. Exactly the same point applies to the paragraph within 2.3.1.11 which discusses English law partnerships and in particular limited liability partnerships and tries to make them fit inside musharaka, instead of asking the question “What should be the Shariah rules applicable to a limited liability partnership?”, or addressing the more preliminary question "Is there anything about a limited liability partnership which makes it impermissible under Shariah?" "Modern limited liability companies (sharikah dhat mas uliyyah mahdudah) share some features with mudarabah if shareholders are seen as the rabb al-mal and executive officers as the mudarib. However, the payment of a salary to executive officers breaks a condition of mudarabah. Instead, the executives could be considered as employees of the company, and this is seen as permitted by some scholars on the basis that they are acting as paid agents of the shareholders. However, in this case, it is not clear which party within the corporate structure could be identified as the mudarib. The decision of company executives on whether to distribute profits in the form of dividends or to reinvest them in the business is not of great importance where a company has a termination date in the near future. However, since most modern companies have an indefinite lifespan, it is rare that their assets are fully liquidated. The common requirement that the mudarib should be paid from the mudarabah profits as calculated on liquidation is therefore unmet in the context of a modern company. Such a calculation would in any case be rather complex given the need to value illiquid assets, and to record the proportion of those assets attributable to the various shareholders, through time." The authors are locked into a mindset where new legal structures (not envisaged when Shariah was being developed by the original schools of Islamic law) have to be shoehorned into the limited set of legal structures already found in Shariah law. Here they are trying to analyse limited liability companies as if they were mudarabah partnerships. However, the whole point is that a limited liability company is an entirely new concept, not anticipated by any of the different schools of Islamic law. The authors do not put forward any reason why limited liability companies should be prohibited, and as a layman I see no reason why they violate any of the fundamental requirements of Islam. Once you accept that limited liability companies are a new concept, Shariah needs to expand to accommodate them. We clearly need within Shariah rules governing the relationship of the Board of Directors with the shareholders, their obligation to manage the business with good faith etc. However what this requires is the extension of Shariah rather than trying to apply principles from an entirely different structure, namely mudarabah, to this new structure. "While in classical fiqh the concept of limited liability does not appear in relation to commercial activity, modernists view it as an essential legal device on account of the role it plays in allowing large-scale business activity to take place. The latter justification is sometimes criticised because such a ruling assumes a maslahah [benefit to the community] where there may be none. For example, it assumes that the consequence of limited liability is something desirable." The authors do not then go on to address directly the question of whether having limited liability companies is generally beneficial to the community or not. Their next sentence makes it clear that limited liability companies are acceptable to the Islamic Fiqh Academy: "However, the practice has been accepted by the Islamic Fiqh Academy on the grounds that those entering into transactions with a limited liability company are fully aware that this is part of the commercial nature of their counterparty." “Consideration of the above viewpoints indicates to us that the position of the shareholder in the modern corporation is most similar to that of a creditor, albeit one privileged to receive all the corporation's net profit, with limited liability to the corporation's debts. Whatever this arrangement is, it is not mudarabah or musharaka." As I explained above, of course it is not mudarabah or musharaka; the limited liability company is something invented by non-Muslims and which all Muslim majority countries have adopted because of their obvious overwhelming benefits to the community. The legal personality of a limited liability company is of course artificial. Its decisions are taken by its board of directors who are themselves appointed and removed by the company's shareholders. The limited liability concept enables companies to obtain equity funding from a wide set of shareholders, many of whom would be most unwilling to provide funds to the company if they could be faced with legal liabilities far exceeding the amount of money they were risking by investing. 3.2.7 deals with "Profit-sharing Instruments" and I was astonished to read in 3.2.7.2 "We should note that a consensus allowing investment into shares has not yet been achieved due to the continuing debate over the permissibility of limited liability in Islamic jurisprudence." In my view there is actually an overwhelming consensus that shares are a permissible Shariah compliant investment provided that they meet appropriate screening criteria along the lines discussed in the later sections of the book. This section should be where the student learns in an objective manner how Islamic banking and finance operate today. 3.1.1 headed "Models of Islamic Banking and Finance" is an unhappy hybrid between a history of the development of modern Islamic banking and an analysis of alternative models, and succeeds in covering neither well. There is also very little analysis. 3.1.2.2 discusses the nature of "Current Accounts" held at Islamic commercial banks. The authors struggle to decide the nature of such an account and whether it is a loan from the client to the bank or a deposit by the client at the bank. Their difficulty arises from the fact that the rules of Shariah they are seeking to apply were developed before banks in their modern form were known. The authors contend that if a current account is regarded as a loan from the client to the bank, then using a cheque to pay for a purchase from another party is actually payment not with money but payment with a debt, which is not permissible for paying the counter value in a contract of bay al sarf (an exchange of money for money covered at 2.2.8). However they do state that the Islamic Fiqh Academy has approved cheque payment as being as good as payment in cash, but do not use this to illuminate their unresolved analysis. Perhaps forgetting that they are talking only about Islamic commercial bank accounts, the authors state "We should note that the nature of a bank account, loan or deposit, remains unclear both in commercial and in legal terms and has resulted in something of an ambiguity at the heart of commercial banking." As far as English law is concerned, there is no ambiguity; all money which customers put with banks is a loan from the customer to the bank. The authors believe that there is an issue that needs to be analysed under Shariah, but then do not proceed to analyse it. 3.1.2.3.1 provides an overview of investment accounts and mentions correctly that under AAOIFI accounting standards restricted investment accounts are off-balance-sheet items shown only as a note to the balance sheet. However it fails to mention that under International Financial Reporting Standards (IFRS) which are used in most of the world outside the few countries that recognise AAOIFI accounting standards, restricted investment accounts are generally on-balance-sheet items. Section 3.2.6 deals with "Sukuk Structures" and in 3.2.6.1 the comment is made "Sukuk SPVs are often registered in offshore locations in order to provide tax advantages for high-net-worth and institutional investors." The clear implication is that something wrong is happening. In my view sukuk SPVs and also conventional securitisation SPVs are sometimes located offshore but only to minimise or avoid the additional taxes that would arise from the multiple transactions involved in setting up the sukuk or conventional securitisation, rather than to confer any special tax benefits on investors. Otherwise a perfectly straightforward transaction can be crippled by the burden of additional taxation which would not have arisen with a simple bank borrowing or the direct issue of conventional debt instead of a securitisation. The book contains a number of case studies where notable transactions are both diagrammed and summarised with sections covering a “Commercial summary”, “Transaction documents” and “Shariah analysis” at the end. This Shariah analysis is the authors’ own analysis, presumably done without access to the original transaction documents or discussion with the Shariah scholars who signed off the original transaction as being Shariah compliant. In many cases the authors criticise the transactions as violating various rules of Shariah. They are of course free to do so, but it strikes me as somewhat odd in the absence of full access to the underlying documentation or discussion with the scholars who opined on the transactions originally. Why is so little Islamic finance done using profit-sharing contracts? 3.1.1 mentions proposals by academics including Nejatullah Siddiqui (one of the authors) that Islamic banks should operate on the basis of a two tier mudarabah structure, with mudarabah investments by customers being used by the bank to enter into mudarabah agreements with entrepreneurs requiring finance. While this is academically attractive, every time it has been tried in practice it has failed for a variety of reasons, of which the most obvious is fraudulent accounting by the entrepreneurs receiving mudarabah finance. Instead of keeping two sets of books (one for themselves and one for the tax authorities) they start keep three sets of books, the third being for the bank! "In any profit-sharing scheme a danger arises that profits will be manipulated by the client in order to reduce the amount payable to the finance provider. In less-developed economies, the reliability of financial information is often poor since accounting and auditing procedures are weak or in some cases non-existent." What the book fails to acknowledge is that this problem is far more widespread than just micro-finance in less-developed countries. The risks of fraudulent accounting by the customer and also the additional negotiation costs involved in mudarabah are the reason why almost all financing of small and medium-sized businesses by Islamic banks is done using murabaha contracts rather than mudarabah contracts. 3.2.7.3 "Practical Hurdles" points out yet another set of problems with providing finance using profit-sharing contracts such as mudarabah. Adverse selection is likely to arise. Entrepreneurs will seek fixed rate finance (e.g. under murabaha or ijara contracts) for projects which they expect to succeed producing high returns, while seeking mudarabah finance for projects which are risky and might produce losses. The authors also rightly point out the risk of moral hazard whereby the mudarib is encouraged to take extra risks since if these risks are successful he shares in the additional profits whereas if the risks lead to losses, the losses are born entirely by the rabb al-mal. Given this recognition of the difficulties and problems, which are the reasons why Islamic banks do not like providing finance under mudarabah, I am disappointed that academics keep promoting this concept instead of acknowledging that it does not work in practice. 3.3.6.6 "Futures, Options And Other Derivatives" again mentions Professor Kamali's argument that the use of a clearing house to guarantee futures trades removes any gharar, but then proceeds to ignore this point rather than addressing it. The authors should either say that they disagree with him and explain why or confirm that they agree with him; the point is of great practical significance in view of the importance of futures contracts in finance. The last part of section 3.3.6.6 mentions the Deutsche Bank academic paper published in 2006 on their website but without going into detail. Details would have been welcome as the Deutsche Bank structure shows how much can be achieved using wad agreements in Islamic finance and full details of the structure are on the Deutsche Bank website. The authors fail to make the point that the Deutsche Bank structure could be used to provide an Islamic investor with a total return swap against any reference asset no matter how non-Shariah compliant. If the Islamic investor considers that a casino company might be a good investment, he can arrange with an investment bank to enter into this Shariah compliant total return swap so that he receives a return equal to that achieved by investing in the shares of the casino company while paying a preset return to the investment bank. The structure has been criticised by Shaykh Yusuf Talal DeLorenzo in a response that is also available on the internet. "Tabarru means donation. Other scholars prefer to use the word musahamah which means contribution. We have already seen that by donating a sum of money to a common pool for mutual help there is no legal connection between the donor and the money donated. The two parties in such a relationship are not using an "aqd al-muawadah" (a bilateral contract). Instead, the basis on which the insurer receives the premium, and on which the insured receives the payment on a claim, is that of a binding wad. The holder promises to contribute to the fund, and in the event of a claim the takaful company promises to meet the claim." In my view, before analysing the arrangement one needs to be clear what the arrangement is. There is no question that in takaful the only reason the customer pays money to the takaful company is that the takaful company is under a binding, legally unavoidable requirement to indemnify the customer should he suffer the loss referred to in the agreement between the customer and the takaful company. The customer has absolutely no donative intent; he is not paying this money because he cares whether other customers have their losses indemnified; he is paying it to ensure that his loss will be indemnified if it occurs. Where the takaful company is operating in the UK, the legal agreement between the customer and the takaful company will be an insurance contract as defined in the UK insurance legislation, and indeed the takaful company will be licensed as an insurance company. The Shariah analysis which is discussed in the book regards it as significant that the agreement between the customer and the takaful company is not a "contract" as interpreted by Shariah but is instead a payment by the customer in exchange for the takaful company entering into a binding wad. The Shariah analysis is of course a matter for the Shariah scholars but everyone needs to clearly understand that the arrangements in takaful are purely commercial and not “charitable” as the word “charitable” is normally understood in English. Accordingly, I take issue with the Shariah analysis in the last section of 3.4.8.2.2 which states "The status of participant contributions is ambiguous (they can be seen as either investments or charitable contributions.)" As I have explained, the one thing that they are not is “charitable contributions.” Anyone who considers that they are has simply failed to recognise the commercial reality of the arrangements. 3.4.8.3 deals with the "Wakalah Model" in takaful. The overview in 3.4.8.3.1 explains that fiqh concerns with the mudarabah model encouraged scholars to look for an alternative which led to the emergence of the wakalah model. The authors omit to mention that the wakalah model is also commercially more attractive to takaful operators since they get paid earlier. With the wakalah model, the operator charges a fee as soon as the contribution is paid whereas with the mudarabah model the operator gets paid by sharing in the surplus which is only determined much later. "In certain jurisdictions, takaful operators are required to run their takaful activities under legislation that regards insurance as involving the transfer of risk in exchange of a premium. However, in the wakalah model, participants are the owners of the fund and hence there has been no transfer of risk to an independent third party. Therefore this model cannot be applied where laws of insurance are so constituted." In my view the above paragraph is far too sweeping. It ignores the fact that for each individual customer, his risk has been transferred to the takaful entity in exchange for the payment of his contribution. Furthermore, in practice the takaful entity will protect itself against catastrophic losses by taking out re-takaful. The basic concepts of insurance law in the UK are as stated in the paragraph but the UK had no difficulty licensing a takaful operator which used the wakalah model as an insurance company. Insurance Practices - premiums may be forfeited on certain grounds such as breach of good faith. Takaful Practices - there are no grounds upon which a paid-in contribution can be forfeited, except where donated by the participant. The reference to good faith in the case of insurance is based upon the English law concept that insurance is a contract of "utmost good faith" which requires the insured to disclose all relevant facts to the insurer, even if the insurer fails to ask sufficient questions. In the case of takaful, it would depend upon the takaful law of the relevant jurisdiction. In the UK, as explained above, insurance law applies so that the customer of a takaful company is under exactly the same "utmost good faith" requirements as a conventional insurance customer. Other jurisdictions would have to be considered on a case-by-case basis. In Malaysia, takaful operators are regulated by the Takaful Act 1984 which makes no mention of a good faith requirement on the part of customers of takaful companies. However, a final conclusion on this point would require reviewing other Malaysian laws which might be applicable. For readers who want to learn more about this general question, there is an interesting article available on the Internet “Regulatory Framework of Doctrine of ‘Utmost Good Faith’ In Takaful” by Prof. Mohd. Ma'sum Billah, Professor of Islamic Financial Regulations & Policies, University of King Abdul Aziz, Jeddah. “Based upon the Maliki principles of jurisprudence, contributions from the members will therefore be considered as ‘iltizam al-tabarru’ (self-imposed donations) because they are unilateral. Therefore it is not a contract of exchange (‘aqd al-muawadah’). Similarly, the payment of compensation from the insurance company in the event of a calamity will also be considered iltizam al-tabarru as there is no interrelation between one iltizam and the other." As far as the commercial reality is concerned, the above paragraph is simply not true. Of course there is an interrelation. The customer only makes the payment to the takaful company because there is a legally binding arrangement under which the takaful company will make a payment to him in the event of a calamity. If the word “unilateral” is being used in a special Shariah sense, in that there is no "contract" using the strict Shariah sense of the word “contract,” then that is a matter for the Shariah scholars. However, the authors should have tried harder to make this distinction clear as any reader who is new to takaful risks simply being confused or worse still misled. This is the final section of the book. From the perspective of professionals working in Islamic finance or students seeking a career in Islamic finance, all of the coverage in this section is strictly irrelevant. It belongs in a book on "Islamic economics" rather than a book on "Islamic banking and finance." The description of the conventional financial system in 4.1 is reasonably good. 4.1.2 is devoted to "Fractional Reserve Banking" and begins with 4.1.2.1 "An Opinion Piece ~ Lessons to be learned from Northern Rock" which is expressly attributed to Tarek El Diwany as it was first published on Euromoney's Islamic Finance Information Service in December 2007. "The overall trend is therefore for a growth in money supply (and hence debt) over time. As a result of this tendency, every modern nation suffers from inflation. In more recent times, this inflation has been disguised by various statistical techniques. For example, although houses are the most expensive item that most individuals ever buy, they are excluded from the common measures of United Kingdom inflation." The editor fails to point out that low but positive inflation is a specific policy objective of almost all governments in capitalist countries. The reason is that, because wages are hard to reduce in monetary terms, deflation (negative inflation) has very damaging economic consequences and is almost always associated with recession, or even depression. Zero inflation is better than deflation but difficult to achieve without the risk of falling into deflation. Low positive inflation (e.g. 2%) provides a safety margin against falling into deflation. Furthermore, low positive inflation enables adjustments to take place in the relative wages of workers without requiring many workers to take explicit pay cuts; workers whose economic value has fallen simply receive smaller (or zero) monetary pay rises rather than being asked to take explicit pay cuts. As mentioned above, wages are hard to reduce in monetary terms. “During the autumn of 2007, semantics were deployed heavily in the United Kingdom so as to minimise public awareness of the black art of money creation. At first, the public was led to believe that the money used to rescue the Northern Rock bank from a bank run was "taxpayers’ money". It was nothing of the sort. It was new money, created in a few keystrokes by the Bank of England. Realising the impossibility of explaining how more than £20 billion of "taxpayers’ money" could be collected and disbursed in just a few weeks, the authorities soon amended their language. The rescue package was then referred to as a "taxpayer backed loan", which implied that if Northern Rock could not repay the money created out of nothing by the Bank of England, then the British taxpayer would." I have no interest in defending the loose language of politicians at different points in time. However in the above paragraph, the editor manages to be both right and wrong at the same time. The money the Bank of England used to lend to Northern Rock (secured on Northern Rock’s mortgage assets) was indeed manufactured with a few keystrokes by the Bank of England. However, despite the editor’s contention, this was all taxpayers’ money. The Bank of England is owned by the British state and all of its assets therefore belong to us as taxpayers. When it makes a profit, that is good news for all taxpayers since in due course that profit can be paid as dividends to the government, thereby reducing the need for taxes pound for pound. If the Bank of England makes a loss, that is eventually suffered by we, the taxpayers, who own it. On page 387, the editor gives a footnote reference to comments on banking by Frederick Soddy. I was surprised to see this name as I recall him as a scientist; indeed he was awarded the Nobel Prize in chemistry in 1921. Like the editor and like many other individuals (but few economists) Soddy became a critic of fractional reserve banking but his opinions on the matter have to be considered those of a layman. The book devotes almost 30 pages to the editor’s rant against fractional reserve banking. Despite the book’s claim to balance, on this issue it displays none at all, as it fails to provide any balancing text in favour of fractional reserve banking. The reality is that all capitalist countries practice fractional reserve banking, it is supported by almost all of the world’s economists, and no country is seriously considering moving away from it. 4.2 discusses “The Islamic Monetary System” with the views of Shariah scholars on money being explained in 4.2.2. Many Islamic economists argue for a return to the use of gold and silver as money instead of the fiat money used by all capitalist economies. If they regard the use of gold and silver as religiously mandated, then they are entitled to their views on religious interpretation but one would need to consider whether they had construed the original sources correctly or not. However, Islamic economists also seek to promote the use of gold and silver as a replacement for fiat money on pragmatic grounds, to improve the operation of the economy in the real world. In doing this, they appear to ignore the point that every country abandoned the gold standard for practical reasons and that there is almost no desire to move back to the gold standard amongst mainstream economists apart from the occasional monomaniac who one can find in every profession. 4.3 "Rebuilding the Islamic Economy" proposes replacing capitalism by an Islamic economic system. Looking back at an Islamic economy that operated some 800 years ago in a much simpler environment is not an adequate instance of Islamic economics in practice to contrast with capitalism as we find it today, quite apart from the need to establish precisely how the mediaeval Islamic economy actually worked and objectively assessing its advantages and disadvantages. The capitalist democracies of Europe, North America, Japan and Australasia are the most successful and freest societies in the world. In them Muslims are freer to practice their religion and live their lives in accordance with their religious views than they are in most Muslim majority countries. This comparison of an actual system, which both works and has flaws, with a hypothetical ideal system reminds me more than anything of the comparisons that used to be made 100 years ago between the evils of capitalism in practice and the wonders of socialism once it could be brought into effect somewhere. I was pleased to see there was an index but unfortunately it is almost completely useless. It appears to have been prepared by using a standard indexing tool, but without any thought being applied to the process. For example the word "agreement" is indexed giving 83 separate instances where the word occurs. However there is no attempt to sub-classify the types of agreement being indexed and from the perspective of the user, such an index entry is of no value. In any future edition, the index needs to be replaced by one prepared with sufficient human intervention by a person who both understands the subject and is familiar with the way that indices in academic books are normally prepared. The conventional financial system exists to meet the needs of its users. People's needs include money transmission, low-risk savings (such as deposit accounts and government bonds), higher risk savings (such as corporate bonds, mutual funds, equities and hedge funds), the need for finance for consumption expenditure, lumpy purchases such as cars or houses, and business finance. They also need protection against risks such as theft, fire, unexpectedly large medical bills or premature death. The modern conventional system of banking, investment and insurance has developed to meet these needs. As explained in my piece “Are Islamic banks Islamic enough?” many Muslims have no fundamental objection to using the conventional financial system. Other Muslims avoid the conventional financial system, and Islamic banking, Islamic investment funds and takaful have been developed to meet their needs. As non-Muslims and Muslims have essentially similar needs, it is no surprise that the conventional financial system and the Islamic financial system look similar. There is a third subset of Muslims, who deplore both conventional finance and Islamic finance as currently practised. However, apart from occasional small-scale initiatives such as the Ansar Finance Group mentioned on page 266, but not listed in the index, this subset of Muslims have not so far created organisations to viably offer finance in a manner they regard as Islamically acceptable. The book actually says very little in detail about the precise changes to current Islamic finance practice that the authors would like to see, other than expressing a somewhat generalised desire to see Islamic banks taking on more risk but without addressing what customers are going to be charged for that extra risk. Instead of spending 81 pages on Islamic economics, the authors should have attempted to outline how they consider Islamic banks should be run, including assessing the feasibility of their ideas. The book might then have lived up to the second half of its title. After I published the review, on 2 September 2010 I received the response below from the Editor which is reproduced in full with his permission. I now leave it to readers of the book to make up their own minds on the points mentioned in my review. Thank you very much for preparing this review and also for inviting us to comment on it. You have clearly spent quite some time producing it and we will inshaa'Allaah re-visit many of your points when producing the second edition. Our reasons for including some historical, theological, legal and economic context are set out on pages xxiii and xxiv. We have adopted a holistic approach because this helps in understanding some of the specific banking and finance issues that are presently arising in the industry. For example, disagreements over what constitutes a valid source of knowledge can lead to different Shari`ah opinions on financial products, and the issue of how Shari`ah can be implemented in the modern day necessitates some discussion of both the judicial framework in Islam and the objectives of Shari`ah. All of this consumes much of section one. Likewise, section four discusses the economic consequences of the debt-based paradigm of modern finance. This is an important discussion, given that the Islamic banking and finance industry has adopted the debt-based paradigm for itself, and the fact that Muslim jurists tend to look at the consequences of a particular system before ruling on its validity. I was recently with Professor Richard Werner, Chair in International Banking at Southampton University, who used the term “quantitative easing” during the 1990’s while advising the Japanese government on monetary policy. He said to me that fractional reserve banking is the main economic issue of our time. He is accompanied by many senior politicians, academics and Muslim thinkers around the world including progressives such as Sheikh Hamza Yusuf and traditionalists such as Sheikh Ramadan al-Buti and Sheikh Muhammed Taqi Usmani. Unfortunately, this is a position that the “mainstream” in Islamic banking and finance has studiously ignored for over three decades with fundamental implications for the structure and product range of the industry. Having included in our textbook some two hundred and fifty pages of material on the ideas and practices of the mainstream, it would be wrong to ignore the issue of fractional reserve banking and the alternatives to it. Yet now we find ourselves criticised for lacking objectivity! If only others would include some of our views in their publications! So far as I am aware, none of the major undergraduate textbooks presently available on this subject deal with this range of topics in greater detail than we have. Where you feel that we have left points "hanging in the air" without resolution, I would say that the discussion has been taken as far as undergraduates need to go. This is not a lack of intellectual rigour, as you imply. Very many points cannot be resolved at this level of discussion, and many others remain unresolved by the Muslim scholars themselves. We have therefore suggested further reading at the end of every sub-section for those who wish to progress to a more advanced level. You find the text "bitty" in some of its discussions, but so what? That is almost inevitable in a text of this kind. If we were to aggregate all of the theoretical issues in one place, separate from their practical applications, it would have produced a very dry book. We have instead examined basic principles at the outset and then elaborated upon them during subsequent reviews of industry practice. The general approach of your review is to identify occasional weaknesses (specifically mine) and then inaccurately present them as evidence of fundamental flaws in the book. Your criticism of the index is a case in point. Of some 870 entries in the index, approximately 85% show 16 page references or less, which is typical for an academic work of this length. You are right that a second level would benefit the index, but to say that the index is "almost completely useless" on account of the other 15% of entries is a terrible misrepresentation. Many long-time specialists in Islamic finance and Islamic law have advised on the content and structure of this book over a period of two years. We are therefore confident of its merits, and indeed several academic departments across the world have already adopted the book without prompting from ourselves. Like us, they have recognised that students are keen to hear alternative points of view in this field and not be confined to the self-serving arguments of the Islamic banking industry. We have gone a lot further than others in meeting that demand, while being careful to give each side a fair crack of the whip. As a measure of our continued commitment to even-handedness, you are welcome to contribute an opinion piece for our second edition making a case in favour of current industry practices. No human being is perfect of course, so may Allaah forgive us our errors and protect all of us from them. Amin.